I just wanted to share a few pictures of my chair that I had recovered this summer. In the picture below you can see what it used to look like. I used to keep it wrapped with an antique sheet. I had it recovered in one of my antique hemp linen sheets. I purchased some Florabella actions this last week! Now I know what I have been missing out on all this time! I used actions on all of the pictures in this post. You can see both of these pictures have slightly different actions applied to them. I can't wait to show you what a difference they made on some pictures I took of my nephew's wedding. I was so disappointed in how my pictures of the wedding turned out. However I was able to salvage a few of my pictures with the Florabella Actions. The chair turned out so beautiful!! Your pictures are great, I love the subtle difference! Have a great weekend! It is dreamy, something I would love in my bedroom!! Very inspiring! the footstool is amazing too! Gorgeous my friend!!! Why aren't you using xlarge pics??!! :) The chair is beyond fabulous and your pictures are too!!! The chair is gorgeous, the grainsack you put on it is perfect. What color is the frame on the mirror, if you don't mind my asking? I have a filing cabinet I would love to paint that color. I'm going to check out the photography app, it looks like it really makes a difference in the photo's which are already fantastic. I love all your pics. Blessings. Your chair turned out lovely. The fabric is just perfect! beautiful maria! i just can't seem to cut into my hemp cloths though....hhhmmm...how did you do it? Your chair turned out beautifully Maria, I love the lines of it and the hemp linen suits it perfectly! Your photos are wonderful too, I'll have to try the Florabella actions, they really do make a nice subtle difference. And I'm looking forward to seeing the pics from your nephew's wedding! Aren't those actions just the BEST? Girl, you are going to have so much fun editing and playing! Oooh I love those actions. I am totally hoping over to the site. But, more importantly, what a great chair! I think two of these would look darling in any living room. 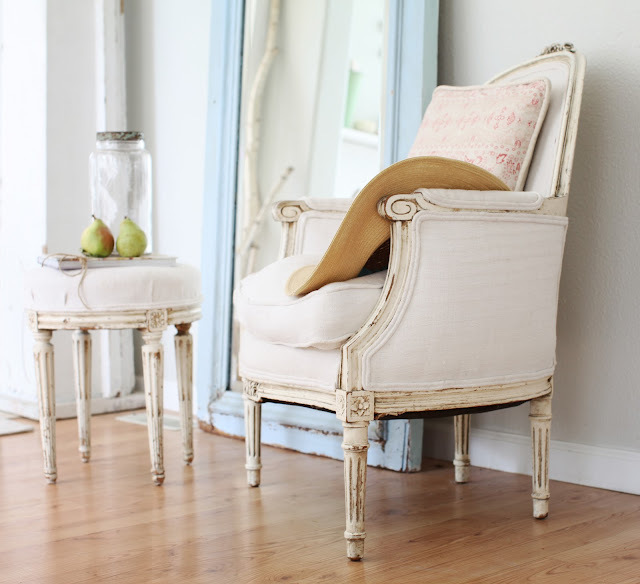 Love the chair re-do and LOVE your living room! Niice post this is, chair is looking great. I'yo enjoyed seeing a bit of 'you' again. the chair is gorgeous maria. and i love the pillow that is on it too. what actions did you use. i have them but need to play with them more. great shots. and weddings are hard!! Maria, your chair turned out beautiful!! Your antique linen looks so soft to the touch... just gorgeous!!! Your chair looks just beautiful...you have such an eye for things! I love love love that chair! Absolutely Frenchy and stunning. Love the stool too, what a perfect pair. J'adore your blog! I love FloraBella AND I love your chair. It's just beautiful. I bet you're glad you had it done. Love the chair! That fabric is simply perfect. 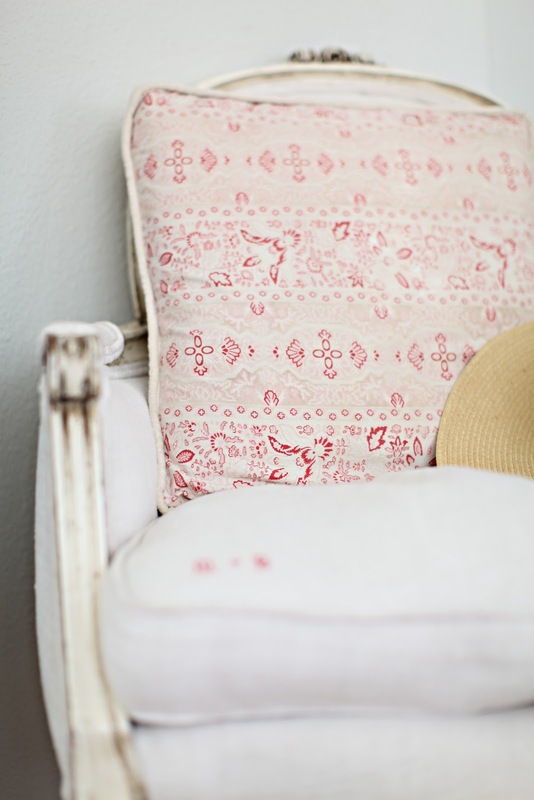 I have an old chair with similar style that I am waiting to find the perfect fabric to use to recover it. Oh my dear, this looks sooo great! I would love to come and sit with you in these chairs!!! I took those pics in the morning light! This is my favorite time for photography! Fabulous chair! It looks so good in your room. wow, your chairs are so beautiful! So special! Hey Maria! I love how your chair turned out, which is funny since I thought if you never changed it, I loved how it looked before LOL...That is so cool you are using the Florabella Actions, I love how pictures look with it and hope to learn how to use it someday...all in all, fabulous as usual. PS - I love the big light blue mirror behind it too - you really have the touch. The chair looks great. I guess I need to purchase photoshop first. Love the chair makeover. The hemp material was a good choice, also really like that pink cushion. Love it, Maria... it's beautiful. Have a great weekend, is it raining there too? Your chair looks so nice Maria!! What a difference! I keep playing with my photos too...makes my blog look a little better, and it's fun. Your chair is stunning, Maria! I love your throw pillow as well. And, your photos are gorgeous! You always have such pretty posts! Have a great weekend. It looks like their is a little monogram on the corner of the chair's seat...I like how you saved that part. Your chair turned out beautiful. Love it! You did amazing job! 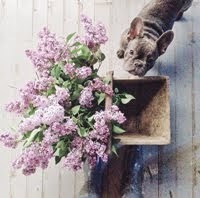 Just a little note to say a big thankyou for your beautiful blog , so full of inspirational ideas. Such a sweetie of a blog, always a treat to visit. Loving your new picture banner, super little chair, I can't resist antique linen sheets either. 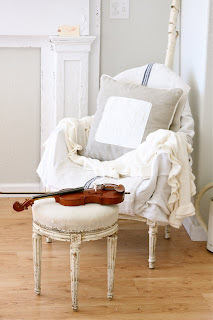 Love your chair makeover Maria and your pictures are always so beautiful! 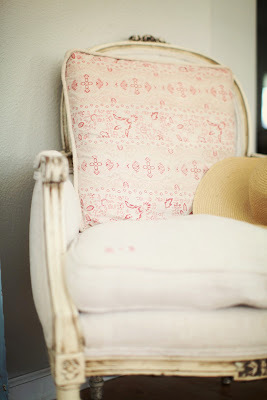 Your chair makeover is so gorgeous, Maria - I love the detail on the wood & the antique hemp fabric! Your header change is fabulous, too! Gorgeous chair and I am so glad you put it in your header!! I think better start doing some homework on photo editing ~ looks like I am missing out on alot of fun! I've missed you and your posts! I love the chair and the photos! I have photoshop and don't have a CLUE how to use it...gotta take a class eventually!!! And, then I've gotta add those elements to it! Love the chairs, new header, and you!!! I love Florabella too. What set did you buy? your talented...and wow, the mirror is fantastic!!! Heavenly!! Love the chair and the mirror. 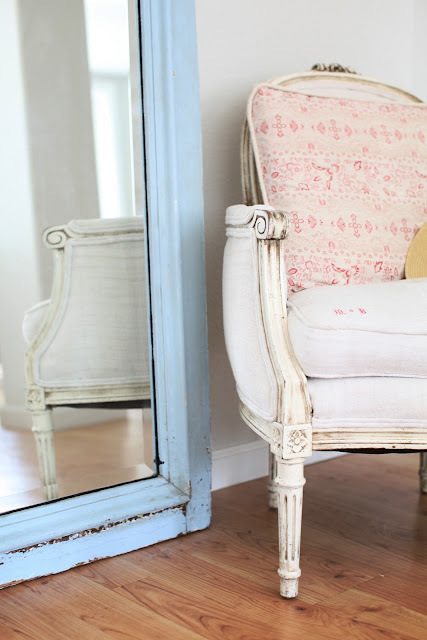 Love the chair...it makes a gorgeous blog header. My hubby got me photoshop this summer and I still haven't taken the time to figure out how to use it. I don't even know what 'actions' are. But I like that name 'flora bella'. I'm in love with a chair. hi maria! i always love your pictures! and i love how your chair turned out! i have one thats very similar that i want to redo! its sitting in my garage where its been for over a year! i think you might have put a spark under me! thanks! Hi Maria! I love to see pictures of your house... and your chair is just perfect ! Did you do this work by yourself ? 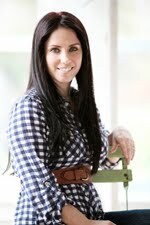 gorgeous, and I love your blog!! We have very similar tastes, as I love all white! I love it Maria! I need to have my bench and french chair recovered... at least the bottom cushions. Yours looks great! Just gorgeous! !Well worth the wait I would say after all that time under a throw!!Lovely! How I love your style!! You always have nice photos...and inspiring! Now.....can you come over to my house and work your magic here....? stunning! as is everything to go with it...congrats on being in Fifi's book! Wow....what a beautiful blog you have!! You inspirate me!!! Hpoe it`s ok for you, if I link you to my blog??!! Maria your chair islovely! I know how it is to have a cover draped over a chair because you like the chair but not so much the upholstery! 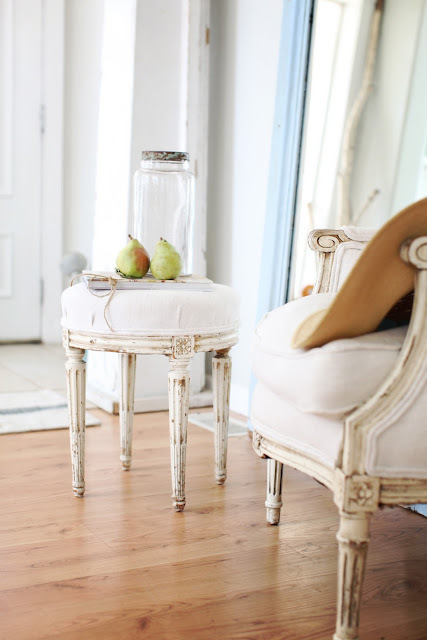 Please come by my blog and enter my giveaway for a copy of The French Inspired Home. Now I know you are over the moon about being in Fifi's new book (which I preordered) but this book has lovely frenchy images too! Hi dear Maria!!!! I think your chair is FAB!!! You really did a wonderful job!!! Have a great new week, dear! What a beautiful chair..I've never seen anything quite like it!! I love what you've done to it! Gorgeous. I am inspired to keep working on distressing the buffet in my living room. Great work! Pitter patter! Love those nubby French linen sheets with little red monograms! So very pretty. I always love the beauty I find here. Your images are so soft and beautiful. I posted your wonderful bedroom on my Italian blog, as agreed! I'll wait for a coffee! 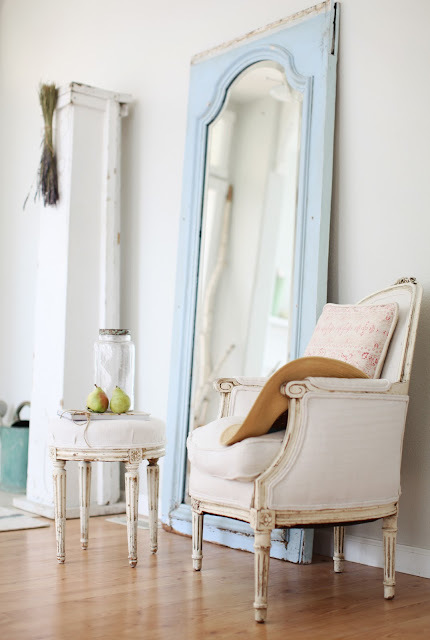 I just love the way you decorate your home :) it`s so calm and fresh. Love your chair. I have a similar chair to reupholster but sadly not the skill to do it myself. Beautiful as is everything you put your dreamy white touch on! 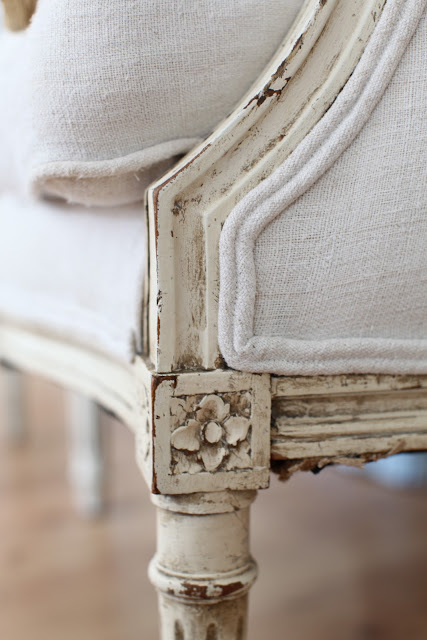 Love that you repurposed and used vintage linen to recover. Beautiful chair and absolutley beautiful home. I am new to blogging so this is an inspiration for me. 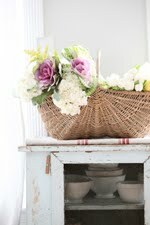 http://Lavievintagebleu.blogspot.com. Wow, that is a dreamy chair! The linen is GORGEOUS! 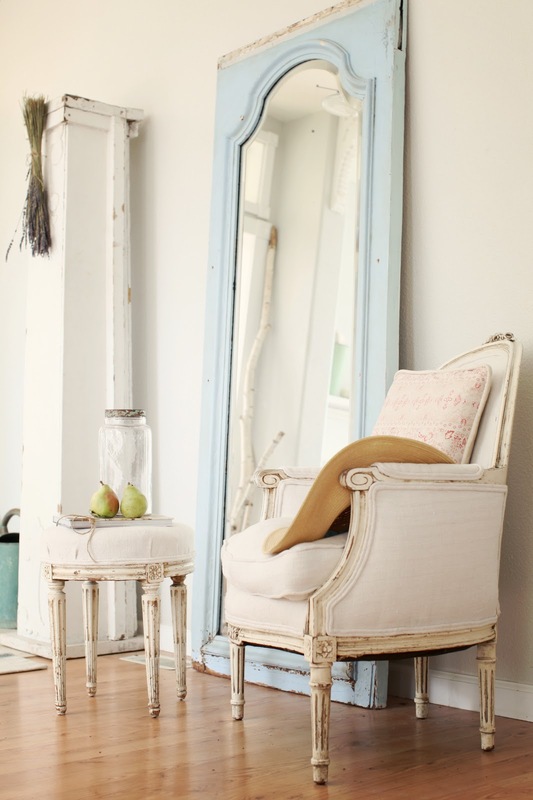 Love the chair and foot stool, you did a beautiful job. 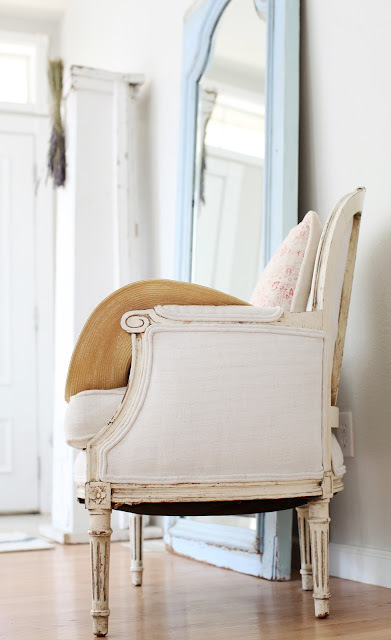 You are so lucky to have that skills making an old chair into a brand-new looking one. It's totally gorgeous! Happy new year. I saw this image on interest today and repined it. I was not in the blogging world in 2010 when you posted this. But when I looked at it more closely I thought, that is Maria's pillow. And so it is. I think this is my favorite of any of your posts! I just love it! I wish you and your family a happy, healthy, and prosperous 2012. I do trust all the ideas you've offered for your post. They're very convincing and will definitely work. Still, the posts are very brief for newbies. May just you please prolong them a little from subsequent time? Thank you for the post. You havre a beautiful blog love your ideas. back later on. I want to encourage you to ultimately continue your great posts, have a nice evening!